Elfdemon_ had the most liked content! Wrote over 60 articles. Contributed over 800 images to our gallery. Namine is not Ventus and Kairi's daughter. And Roxas is not Ventus and Sora's kid. Kairi is a Princess of Heart, so she has no darkness in her heart, so she can't form a Heartless. If her heart is lost, it doesn't become a Heartless. And therefore, she doesn't form a Nobody. In order for a Nobody to be created, a Heartless needs to be created. Instead, her body just lays comatose with no heart. Kairi's heart was within Sora. When Sora stabbed himself with the Keyblade of Heart, his heart and Kairi's hearts were released. In order for a Nobody to be created, a heart needs to be released from a body and a Heartless needs to form. Sora's heart was released from his body, which turned into a Shadow Heartless. Which also created Sora's Nobody, Roxas. Kairi's heart was released from a body, Sora's body, so a Nobody was created, which is Namine. Since it was Kairi's heart that was released from a body, then it's Kairi's Nobody. Sora's Heartless acted as the Heartless needed to form a Nobody for both Sora's Nobody, Roxas, and Kairi's Nobody, Namine. Roxas is made out of Sora's body and soul, and Namine is made out of Sora's body and soul, even though she's Kairi's Nobody. At the end of BBS, Ventus' heart was fractured, so it went into Sora's heart to recover. Ventus' heart was still within Sora's body when he stabbed himself with the Keyblade of Heart, but instead of getting released like the other hearts, it stayed behind within Sora's body, therefore staying within Sora's Nobody, Roxas. Ventus' heart within Roxas is what causes Roxas to take on the appearance of Ventus. 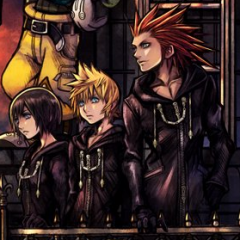 If Ventus' heart wasn't within Roxas, then Roxas would look like Sora. And now that Roxas is within Sora currently, Ventus' heart is back within Sora as well. Kingdom Key is not "the Keyblade of the Realm of Light" and Kingdom Key D is not "the Keyblade of the Realm of Darkness." As far as we know, they are not special Keyblades in any way. There are no Keyblades that single handedly represent a realm. There are three types of Keyblades: Keyblades of Light, Keyblades of Darkness, and the Keyblade of Heart. Keyblades of Light are Keyblades forged in the Realm of Light (by The Master of Masters). Keyblades of Darkness are Keyblades forged in the Realm of Darkness when a world falls to darkness that a Keyblade of Light was obtained at, and the Keyblade of Heart is the Keyblade created from the Princesses of Heart's hearts. Keyblades of Light were all forged by The Master of Masters way back in the Age of Fairy Tales by him reaching into the depths of people's hearts, Keyblades of Darkness are forged on a world that a Keyblade of Light was obtained by someone at once that world falls to darkness, and the Keyblade of Heart can be forged/reforged out of all of the Princesses of Heart's hearts. Kingdom Key is just simply a Keyblade of Light and Kingdom Key D is just simply a Keyblade of Darkness. Any Keyblade of Light and Keyblade of Darkness can be used to seal the Door to Darkness. Having a "Keyblade of Between" or a "Keyblade of the In-between" wouldn't make any sense since Keyblade forged in the Realm Between are just Keyblades of Light. I'm guessing the Keyblade that Aqua is using is Mickey's new Keyblade. It looks like a mixture between the two Keyblades that Mickey owns: Kingdom Key D and Star Seeker. So, I'd say he finds a way to fuse or mix his two Keyblades into one. Kingdom Key and Kingdom Key D aren't any different from any other Keyblade of Light and Keyblade of Darkness as far as we know. There are Keyblades of Light, Keyblades of Darkness, and a Keyblade of Heart. Keyblades of Light are Keyblades forged in the Realm of Light, Keyblades of Darkness are Keyblades forged in the Realm of Darkness when a world falls to darkness that a Keyblade of Light was obtained at, and the Keyblade of Heart is the Keyblade created from the Princesses of Heart's hearts. As far as we know, Kingdom Key and Kingdom Key D are not special in any way. Kingdom Key is just a Keyblade from the Realm of Light (a Keyblade of Light) and Kingdom Key D is just a Keyblade from the Realm of Darkness (a Keyblade of Darkness). Keyblades of Light were all forged by The Master of Masters way back in the Age of Fairy Tales by him reaching into the depths of people's hearts, Keyblades of Darkness are forged on a world that a Keyblade of Light was obtained by someone at once that world falls to darkness, and the Keyblade of Heart can be forged/reforged out of all of the Princesses of Heart's hearts. It wouldn't make sense for there to be any Keyblades of Between since Keyblades forged in the Realm Between would also just be Keyblades of Light as far as we know. From what we've seen in Kingdom Hearts III trailers so far, we'll be fighting a Heartless boss in each world, and possibly an Organization XIII member in each world. The only Disney villains that we have seen so far, aside from Maleficent and Pete, are Hades and Lythos. I hope we will still be able to fight against the Disney villains for each respective world. I want to fight Zurg from Toy Story. I want to fight Lythos, Hydros, Pyros, Stratos, and the Cyclops from Hercules. I want to fight Randall from Monsters, Inc. I want to fight Mother Gothel from Tangled. And I want to fight Yokai from Big Hero 6. We fought against Heartless bosses in KH2, as well as the Disney villains, but for Beast's Castle, we fought Xaldin instead of Gaston. I hope that the Organization XIII members in Kingdom Hearts III aren't taking the place of the Disney villains for each world like how Xaldin took the place of Gaston. It's possible that we don't even fight the Organization XIII members in the Disney worlds that they show up in in Kingdom Hearts III, and they just appear and talk to Sora to try to manipulate him like they did in Dream Drop Distance, but it seems like they are trying to make the Disney worlds more relevant to the overall plot (which is a good thing), so it seems sort of like the Organization XIII members might be taking the place of the Disney villains in order to make that happen. If we are going to fight the Organization XIII members in the Disney worlds, then I hope it doesn't replace the Disney villain boss fights, and they are just another separate boss fight instead. Another point of concern is the fact that most of the Disney worlds will have new unique original plots that differ or continue from the respective Disney movies. This is a good thing because it's fixing something many people complained about from the previous games, which is having to play through the exact plot from the Disney movies, but it's a point of concern in regards to which characters will appear in the worlds. The fact that some of the worlds are having plots that continue from where the Disney movies left off could mean that we won't be fighting the Disney villains from those worlds, since they were defeated in the movies. I hope they find a way to make the villains return somehow, because not having a boss fight against Yokai in the Big Hero 6 world or a fight against Zurg or Stinky Pete in the Toy Story world would be a really big missed opportunity. I might be overthinking things, but who knows. What are your thoughts on this? When I first heard Don't Think Twice (called "Chikai" in Japanese), I was sort of on the fence about it. I got super emotional and teared up listening to it the first time because it's the KH3 Utada theme, but at the same time, I was sort of somewhat disappointed when I compared it to Simple And Clean and Sanctuary. But, after listening to it more and more, the more it grows on me. I absolutely love it now. It's a really beautiful song and it really sort of encompasses my feelings towards this series. I can understand why some people think it might be "meh," since I used to have somewhat of that mindset, but I love it now. It's grown on me so much. I can just imagine hearing it as the credits roll for KH3 after a super emotional ending and super emotional game experience as a whole. There's currently no answer as to why Xehanort got recompleted as his old man self rather than as Terra-Xehanort. 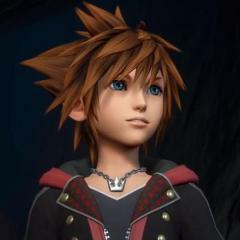 But, it has been implied by Nomura in some interviews that it was done intentionally and will be explained in the future. My personal theory is that Terra-Xehanort was revived, but Xehanort was just simply having his body take on the appearance of his old man self. Bodies are very malleable. You can mold/shape them into different appearances. Which is what Ansem, Seeker of Darkness did in KH1 with Riku's body. He shaped it into one that's more to his likeness and became the Ansem, Seeker of Darkness we all know and love. I think it's possible Xehanort is doing something similar with the Terra-Xehanort body. Who knows though. Sora in Monster form - Orange or grey? His regular base form is gray. He changes color for the different Drive Forms that activate from different Keyblade Transformations. Xehanort wants to unlock Kingdom Hearts in order to be reborn as something far greater than human and recreate the World to have complete equilibrium between light and darkness.